Three years ago, Lisa Conti told us about the retired Google honcho who set about ringing the globe with a network of telescopes available to both school kids and astrophysicists. That effort paid a dividend, made public this week, as the Las Cumbres Observatory Global Telescope Network contributed to discovering a planet that orbits two suns, the first such planet definitively identified by human astronomers. 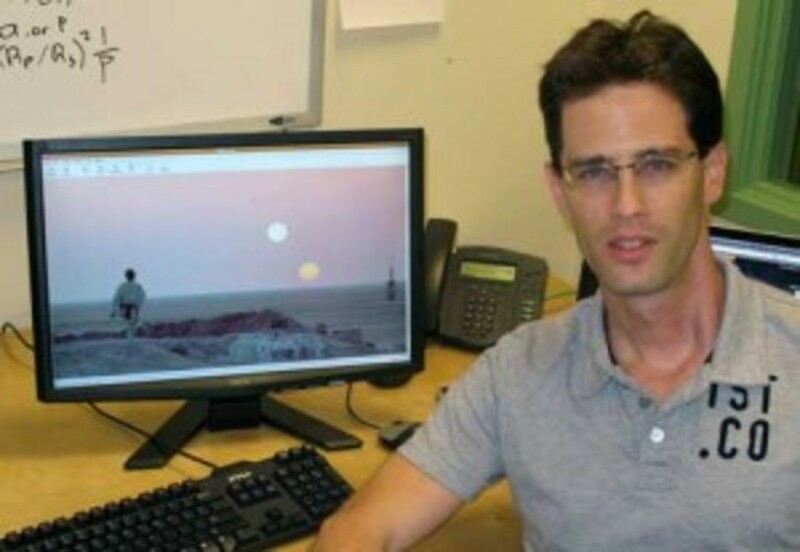 Astrophysicist Avi Shporer, a member of both the Kepler team and Las Cumbres network, sits in front of a picture from "Star Wars IV: A New Hope," in which Luke Skywalker watches the two setting sun of his home planet, Tatooine. Recently, Las Cumbres contributed to discovering a planet that orbits two suns, the first such planet definitively identified by human astronomers. The two suns of the Kepler-16 system played a game of celestial tag that produced brightness dips as one crossed the path of the other; when a third dip occurred, Kepler’s researchers felt they had a planet on the hook. The team, led by Laurance Doyle of the Search for Extraterrestrial Intelligence Institute, then examined changes in gravitational pull — fiddly work at 200 lights years away — to determine that this third body had the right mass to be a planet. While the space telescope is busy making a first identification, the ground-based telescopes of Las Cumbres, among others, wrestle the sighting down until it’s unambiguous. That’s what happened here, explained University of California, Santa Barbara, astrophysicist Avi Shporer, a member of both the Kepler team and Las Cumbres network. "At [Las Cumbres], we are using our telescopes as part of the large effort carried out by U.S. astronomers and others, to follow up and accurately characterize the detections made by Kepler,” Tim Brown, the network’s scientific director, an adjunct professor of physics at the University of California, Santa Barbara, and a member of the Kepler team, explained in a release. While Faulkes is in Hawaii, the Las Cumbres project has or plans to have telescopes in at least seven sites around the world, including California and Texas in the U.S., Australia, Chile and the Canary Islands. This discovery is one of many that Las Cumbres has assisted on, including an exploding star that made news late last month.That supernova first was picked up by a 48-inch telescope at Palomar Mountain in California. Speaking of contributions, Shporer said Kepler, which was launched in March 2009, probably has its most interesting discoveries ahead of it. This discovery of Kepler-16b was announced in the journal Science.